There is a LOT of train traffic in Caliente. 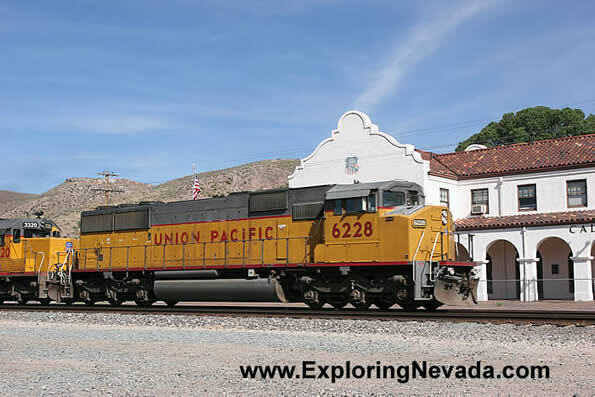 The main line for the Union Pacific (between Salt Lake City and Los Angeles), passes through Caliente. And the trains tend to run in packs. Groups of four trains or more heading the same direction will pass through, then there will be a pause, followed by another group of trains heading in the other direction. The railroad follows Caliente Canyon. Thus, for those searching for good places to take pictures of trains, consider photograhing the Union Pacific in Caliente Canyon. All the steep rock and numerous tunnels make for some interesting photographic possibilities.